I’ve been trying out different versions of this recipe over the past month or so. 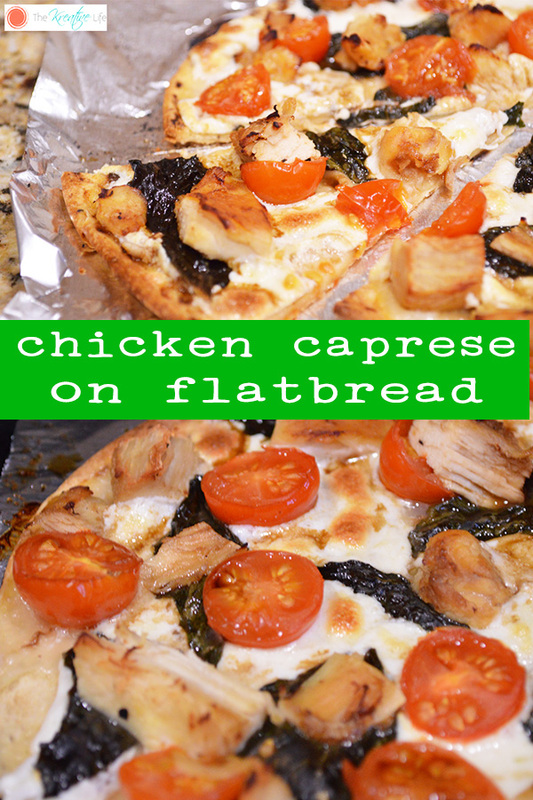 I’ve tried it on French bread and tortilla shells, but this Chicken Caprese on Flatbread is my favorite. I’m not sure if it’s the fresh mozzarella and basil or the grilled chicken, but I can eat this all day. I lived in Italy for three years, so of course I love Italian food! I just never thought I’d make something as good as this. It’s easy to make and doesn’t take much time before you can start enjoying all of it with your family or even by yourself (my favorite way to have it). Enjoy! Preheat oven to 350°. 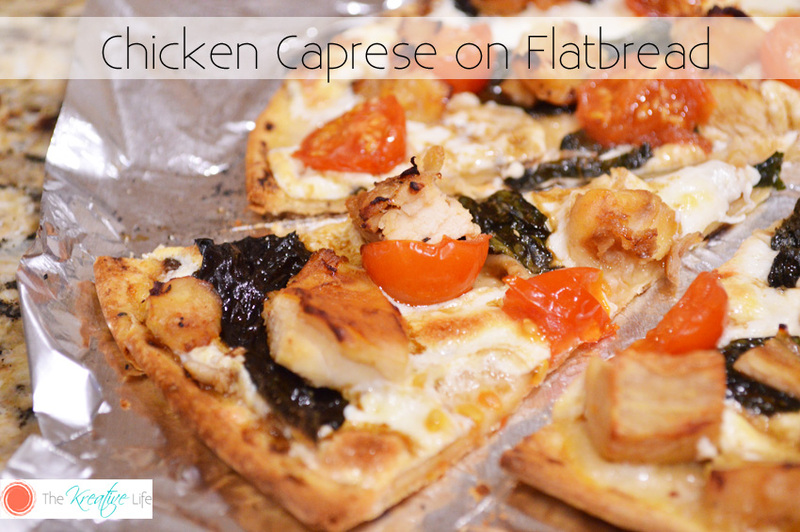 Place flatbread on pizza pan or cookie sheet covered with foil. Using a spoon, spread the olive oil evenly onto the bread. Evenly sprinkle garlic powder on top of oil. Layer mozzarella onto flatbread. 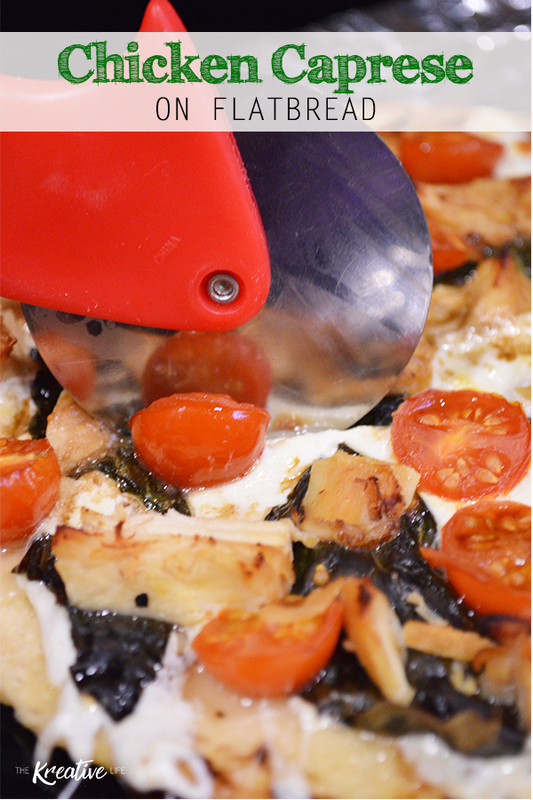 Fill in gaps with smaller pieces of mozzarella. Layer tomatoes on top of mozzarella. Layer basil and chicken on top. Bake for 15 minutes or until cheese slightly browns. Drizzle balsamic vinegar on top of flatbread. Allow to slightly cool before serving. Yum! This looks amazing. I love anything involving the word Caprese! That really does look good. I am sure I would enjoy eating that every day too. I love Caprese and that looks really good. I bet the chicken made it more delicious. This sounds and looks so good! It is really simple, too… making dinner a breeze! Thank you for sharing! 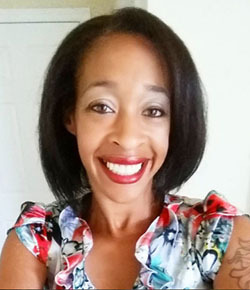 Chelley @ AisForAdelaide recently posted…Taylor Swift did What?! That looks yummy! I want to make this for my family. That looks positively delicious! I’d definitely have several slices. This looks delicious and easy to make. I will have to go get me some flatbread to have on hand to make pizza on them from now on. This looks really yummy and easy to make. I’ll have to try it out.